Victoria’s Secret even has a line of casual wear named after the color. Pink and green make a punch color pair. This duo is preppy and chic all at once. These colors are easy to mix and you can use pale, medium or bright hues. 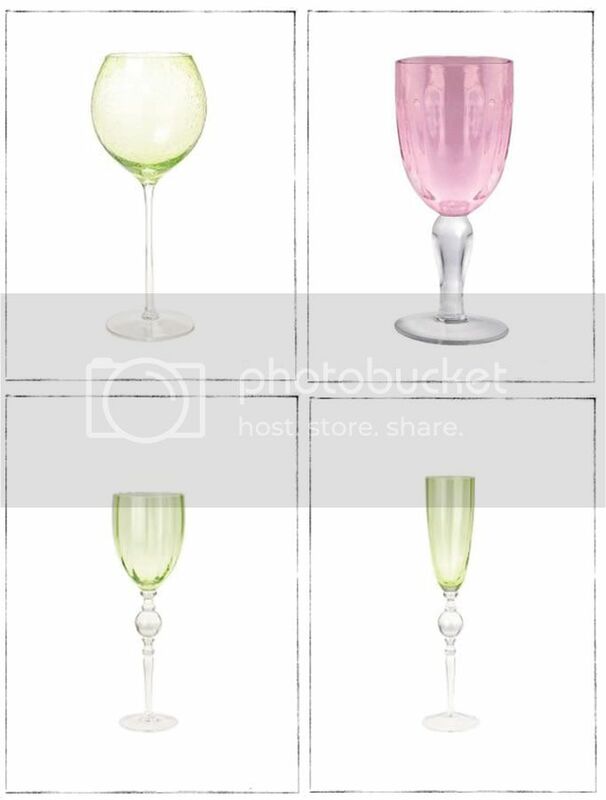 way would be to incorporate either pink or green stemware to your place setting. congregate such as the dining room or kitchen table. (top row: giddy glass, $12.00, Anthropologie; kassie goblets,set of 6, $39.99, Target). (bottom row: backyard wine glass and champagne flute, both $18.00 at Anthropologie). I love this post of course :) The stemware is great and I love the decorating ideas, I wonder if I could make those trees myself looks like a great project (for next year). Natasha, I knew you would love this post! The trees are a perfect DIY project. I found them on Better Homes and Gardens website. Super easy - - - Use pinking shears to cut three 17-x-17-x-8-inch triangles from felt, glue together the edges (leaving the bottom open), and tack on sequins, glitter, or other ornaments. I am noticing a trend of using either red or green as the cornerstone of the Christmas Palette, but not together. It makes for a fresh change. 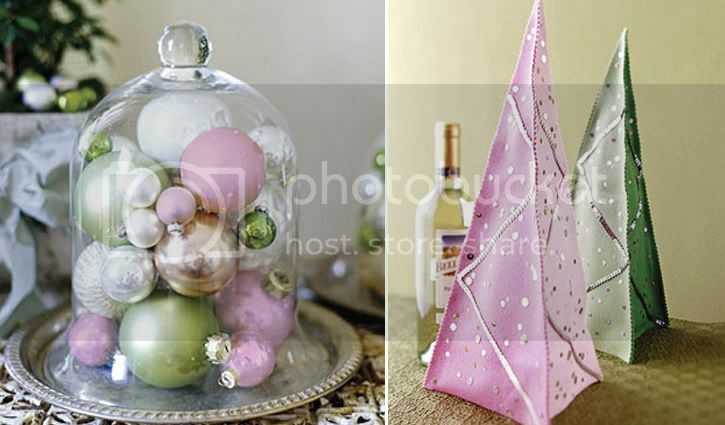 Simply stunnng pink and green for the holiday's. I love the color combination. Last year, I designed centerpieces for a client in red and fuchsia with hints of brown. It was gorgeous. 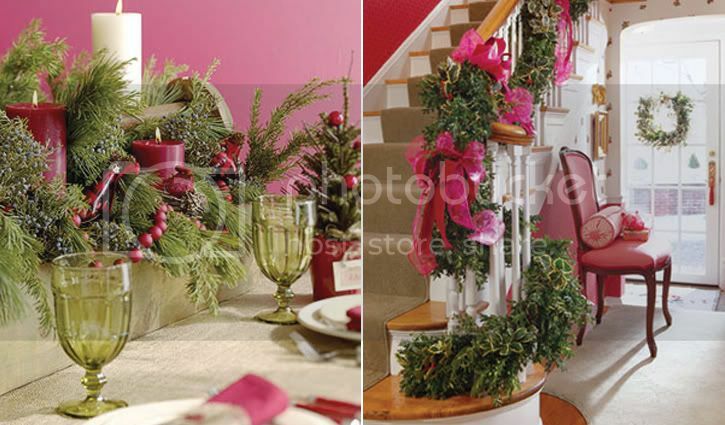 This year, I am designing my front door decorations with several shades of pink, red and a hint of mossy green. 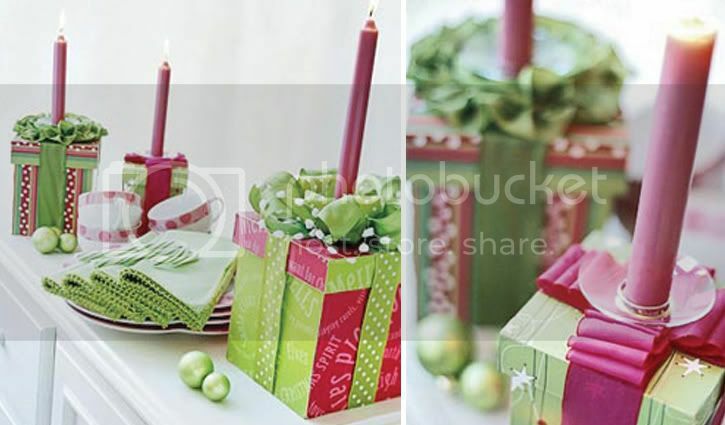 People should explore a pink and green composition for a Christmas tabletop. Like you said Sarah, this duo looks fresh and elegant. BA, yes, I've noticed the same thing. There is a huge trend with people wanting more of a "designer look" when it comes to their holiday decor. Why invest in all things red and green when you can one or the other to your existing decor to infuse the spirit of the holiday! Hey Kim! You are the "queen" of all things chic! I would love to see a picture of that door. I'm sure it is gorgeous. I can't get enough of these colored glass goblets. Such beauties. Love the pink and green - gorgeous!